Morgan W. - My New Netbook! Note: I do not condone breaking laws, downloading software that isn't rightfully yours or anything of that sort. I just love tinkering with things and challenging myself to see if I can make something happen. For about 6 months or so I've been really interested in purchasing a netbook. Not only for the small size but because there's a huge community with interest in running Mac OS X on them. While I would love it for Apple to put out something more official, I enjoy doing it the "un-official" way. One, it gives me something to do, and two, I really enjoy messing around with things and make them work in ways they're not originally intended work! Plus, I've been wanting a super portable Mac for quite some time now! 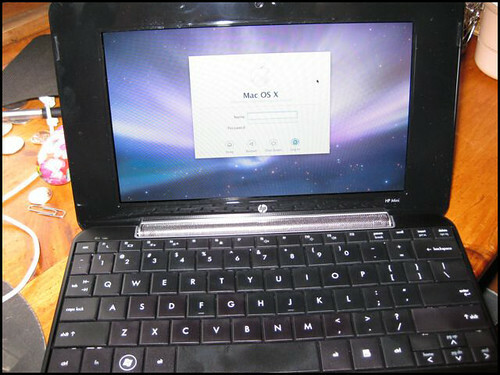 After doing a bit of research, I found out that the HP Mini was one of the better and more supported netbooks out there. I picked one up at my local Staples (I just had to have one and didn't want to wait for shipping) for $300. I mean, that's a pretty good deal right? After perusing through some other forums and threads, I decided to stick with the MyHPMini guide. Seemed simple and quite easy to follow. In a nutshell, one must obtain a specially "fixed" version of the Mac OS X operating system. I went with iDeneb v1.3 10.5.5. I do have a copy of 10.5.6 that I might install should I not be able to easily upgrade my existing 10.5.5 install. You'll first want to format the drive as Mac OS X Extended. I normally do this through Disk Utility but it can also be done on the screen where it asks you where you want to install OS X too. Install it just as you normally would an OS X install, but remember to choose Customized so you can apply a few extra fixes (these are needed because we're installing on a non-Macintosh computer). The fixes you need to apply are outlined in the tutorial. Now, for some reason the install progress screen did not show up for me. I am not sure if this is true for all installs on the Mini, but it did happen to me so I thought it would be worth mentioning. What I did was opened up the log viewer and had it display all log messages. Eventually after about 25-30 minutes my install had completed. The machine rebooted, but after running through about half the OS X Welcome screens it keep kicking me back out to the first one. Fortunately the tutorial explains how to get around this. Basically you need to reboot into single user mode, input a few commands and you're done! Now, even though you've got OS X installed, there are a few drivers that I highly recommend you install so that you can get the most out of your OS X'd netbook. The drivers are for things like VGA, sleep, wifi and a few others. Using the Kext installer (which is one of the applications I recommend installing during the initial install) it's really very simple! Once you've done that, you've pretty much got a cute little Macbook to take anywhere! Now one thing I noticed is that if you're like me and got the 8GB HP Mini you'll only have about 1.5GBs of space left. For some that may be fine, I use my netbook for blogging, web surfing and chatting only so it's not such a big deal. You can also snag an 8GB SD card from NewEgg for about $15.00. The Mini has a built-in card reader which works in OS X. Currently I've got a 2GB SD card and I use it for storing applications. What that does is mounts the drive and allows its contents to be modified, which is exactly what needs to happen. Without running that command, the kext file(s) cannot be properly installed. Second, after you've installed WiFi it doesn't appear to reconnect when you open your netbook from sleep. Now, this only happens to me, and it might just be something I'm doing wrong. I have to go back into System Preferences and select the network I want to connect to each time, even though it's listed in my Preferred networks. The menu bar item also does not work and just tells me that Airport is not configured. I also should mention that I upgraded my netbook to 1GB of RAM although I will eventually max it out at 2GBs. I suggest you upgrade to at least 1GB also, especially if you plan on install Mac OS X Leopard. 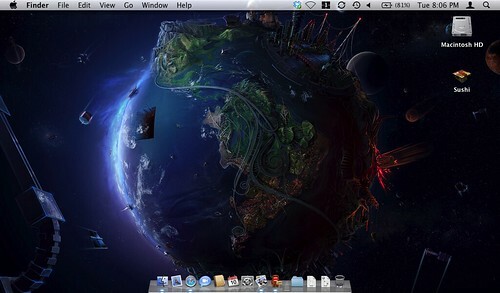 Besides those few issues, I'm really enjoying my new OS X netbook. I take it everywhere I go and I find a lot nicer to pull out on the bus then my Apple MacBook. So far, the battery seems to last about 3 hours which is fine with me, it last the bus ride to and from work and then some. It's really fabulous and it'll definitely hold me over until Apple comes out with their own netbook!